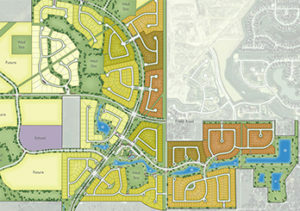 RVi is proud to be partnering with Land Tejas on one of their newest communities. 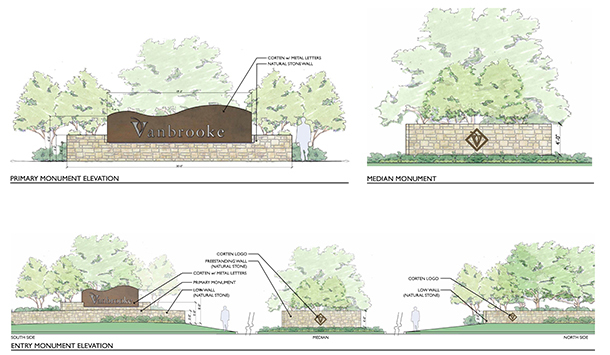 Designed to be reminiscent of the Texas Hill Country and Fort Bend County’s rich history, Vanbrooke is an approximately 250-acre master-planned community located along Highway 359 between the towns of Brookshire & Fulshear in Fort Bend County, Texas. The developer, Land Tejas, is bringing the community to life over the course of three phases in the coming years. 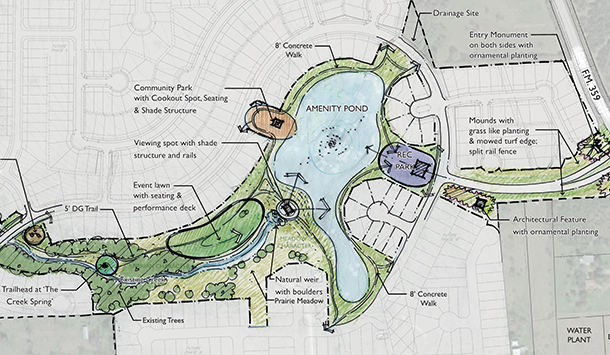 RVi was consulted to provide an overall master plan and vision for the community’s parks and open spaces. Once a master plan was approved by Land Tejas, RVi was contracted to design and provide construction documentation for the marketing trail and recreation site of phase one. The 250-acre site is an old cattle farm consisting of an existing pond, creek, grasslands, and large stand of trees. 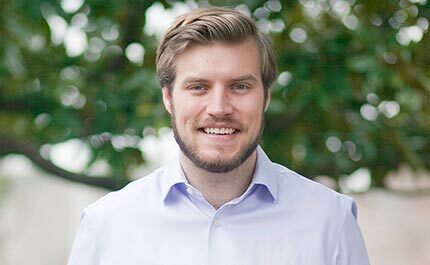 Land Tejas is restoring the existing pond at the center of the development to not only act as an amenity, but also to support the neighborhood’s storm water capacity. An existing creek with mature trees is being preserved to serve as a nature corridor throughout the development. 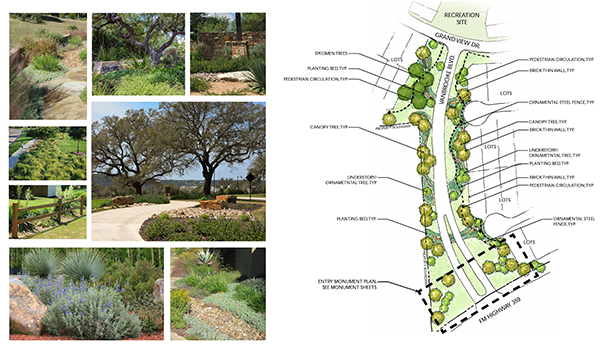 To facilitate the developer’s vision of bringing the Texas Hill Country vibe and small-town atmosphere to the grasslands of Fort Bend County, RVi’s design of monuments, buildings, and amenities utilized materials such as limestone, boulders, wood, corten, and metal. A serpentine rock wall monument elevated on berms with enhanced plantings and lighting greets residents and visitors along Highway 359. The entry boulevard consists of tree planting and trails, which connect home lots to various destination points throughout the community. The entry boulevard terminates at the recreation site where a large open-air pavilion serves as the key focal point. The recreation site was designed to capitalize on views of the restored pond. 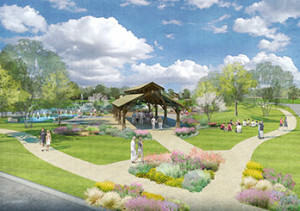 The open-air pavilion includes restrooms, picnic areas, and plaza spaces for families to gather. Residents have the opportunity to utilize a resort-style pool during the summer months. The pool has a beach entry for children and toe dippers, lap lanes for the active swimmer, and a shallow water tanning shelf for relaxation. A splash pad is accessible for children to enjoy when the pool is not open. The recreation site also offers residents a playground area with two play structures, a shade structure, and seating for both children and parents. A large open lawn with berms allows for passive recreation adjacent to the pond. A trail loops around the pond and provides pedestrian connections for homeowners to reach the recreation site. Future phases of the project will extend the trail along the existing creek corridor. The trail will not only provide pedestrian access for homeowners but will also allow the user to interact with nature at their leisure. Additionally, several pocket parks are planned along the trail for passive and active recreation. The pocket parks are set to include open fields, playgrounds, seating areas, and a picnic area located under existing pecan trees. To learn more about Vanbrooke, please visit the Vanbrooke community website.